The Gor Mahia youth team which still occasionally wears the Tuzo labeled jersey have now landed a kitting deal with Quick Label limited. According to the club site, the deal was signed by Chairman Rachier, Manasseh Otieno of the Gor Mahia fans foundation and Quick Label director Richard Nyakwaka. Mr. Richard Nyakwaka is former rugby player who played at second row for the Kenya national rugby XV team. Known as “Quicks”, he played during the 1990s and is an ardent Gor Mahia fan. Rachier expressed his appreciation to Quick Label. ““It’s a pleasure to partner with Quicks Labale Limited because such are the partnership that helps in building the young team.” he said to the club site. “The main idea is to support the youth team to become a center for football education in Kenya. We are happy to do kits partnership with the club and we will work together at various levels to achieve the dream,” he said. Gor Mahia is one of the few KPL sides with an active youth team. They are currently atop the Nairobi county league with 30 points. 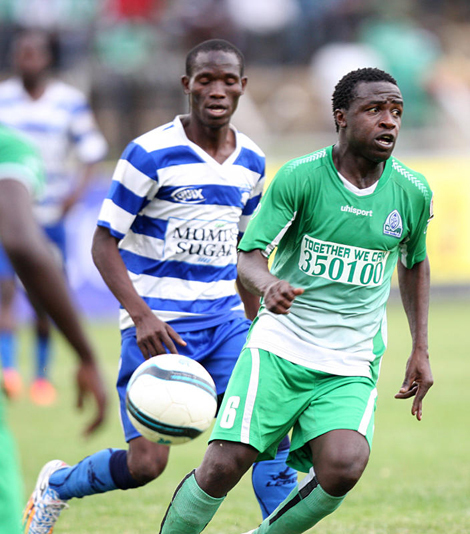 Talks between Gor Mahia and Dan Sserunkuma, who played for the club until last December are still ongoing. A major stumbling block is the fact that Sserunkuma is demanding that he be paid outstanding dues which are owed to him. This is something club officials say they cannot meet. “He (Sserunkuma) is demanding to be paid more than Sh300, 000 which they owed him last season but Gor Mahia officials are unable to fulfill this requirement,” said a source to goal.com. Club official Ronald Ngala confirms that no agreement has been reached with Sserunkuma. If it is indeed true that Gor Mahia owes Sserunkuma 300,000 then the club should pay him his dues out of good faith not as a consequence of him rejoining the team. First it was Rama Salim and now Sserunkuma denying that he has agreed to rejoin the club. If the club cannot come up with the money at once then perhaps they can agree on a payment plan where the club pays Sserunkuma his dues over several months. Considering the how much Sserunkuma has been a valuable asset, the club should pay him. Thika United coach Tim Bryett has hopped on the bandwagon of those claiming that referees are helping Gor Mahia. This is likely an attempt to influence the match officials of Monday’s match between Gor Mahia and Thika United. With the June transfer window around the corner, Gor Mahia are planning the areas that will need to be bolstered. Gor Mahia will be looking to add depth not just for the second leg but also for upcoming events like the CECAFA cup, FKF cup and KPL top 8. According to organizing secretary Ronald Ngala, coach Nuttall has already identified the areas he wants to bolster. Two weeks ago, club official Naima Aketch announced that the club was trying to bring back Dan Sserunkuma on an open contract that gives him the leeway should a better offer come up. Last week Ngala said that Rama Salim was due to rejoin the club. The move is now in doubt with Rama himself having denied that he is undecided. “It is upon him to make his decision if he is not interested in joining us then that is okay, we will definitely look for other available options, we are yet to engage him in talks as we are waiting for the transfer window to open as from next week”, Ngala now says. Though the team is doing well, coach Nuttall likely wants to keep players on their toes by introducing competition. He also realizes that as the season progresses, injuries might begin to take their toll especially as Gor Mahia faces a backlog of fixtures after the CECAFA cup. AFC coach Zdravko Logarusic has joined the bandwagon of people complaining against Gor Mahia. He now claims Ingwe were denied access to train at Kisumu stadium because the stadium belongs to Gor Mahia. But KPL CEO Jack Oguda has said that no one in the KPL owns a stadium. Oguda has directed AFC to lodge a formal complaint. “In this case, we would ask Leopards to lodge a complaint with the stadium management if indeed they were denied an opportunity to train because it is denying the county government business and paints a bad picture,” he continued. The Kenya Premier league has announced on their website that the match between Thika United and Gor Mahia, originally scheduled for Sunday, has now been moved a day later to Monday, kick-off 6pm, at Kasarani Stadium. This is because of the unavailability of Thika County Stadium, Nyayo Stadium, Kenyatta Stadium and Kasarani Stadium on Sunday for this home fixture for Thika United. 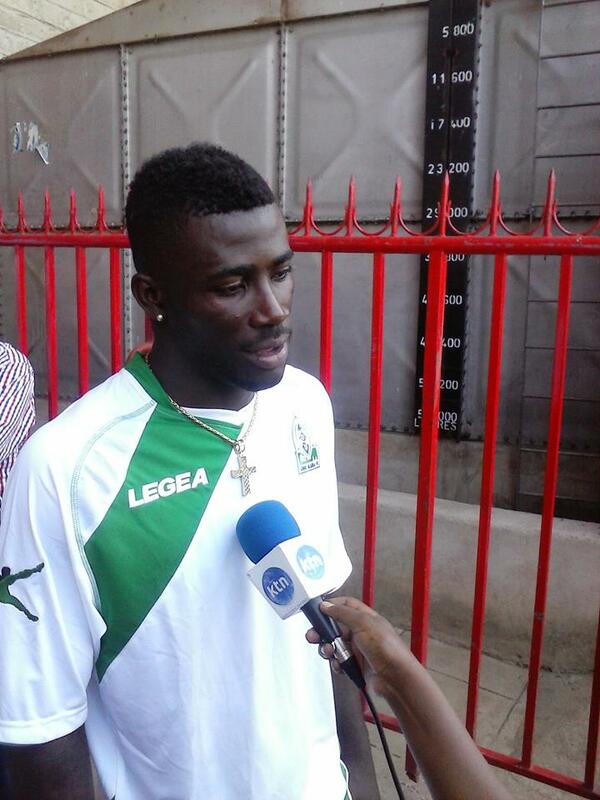 Gor Mahia defending Dirkir Glay is rearing to make a comeback after having been sidelined by a shoulder injury. Glay is dissapointed at being away from the playing field but he is happy to be back training. “I feel bad for being out for this long; it is something no player can enjoy. My shoulder injury took time to heal, but I am good right now. I have been training and I hope to be back soonest, it is football,” Glay told goal.com on Tuesday. “My target is to get back and help Gor Mahia that is what I am aiming. Good thing is that the team is performing better and the main challenge will be getting my place back since everybody is performing better. It is all about working harder in training and make sure my form is back, and grab the opportunity with both hands. Glay who was signed from Gor Mahia this season is happy with his current club. Glay’s return is good news as it gives coach Nuttall additional options as the club prepares to play Thika United which is Glay’s former club. In addition to Glay, Gor Mahia will likely welcome back Godfrey Walusimbi whom reports suggest had gone missing from training due to unresolved salary issues. The issues have been resolved and reports suggest he joined the team in Kisumu last weekend. Thika United coach Tim Bryett wants his team to take advantage of their underdog status to end Gor Mahia’s unbeaten run. However Bryett will be dissapointed because this Gor Mahia team has been conditioned to be relaxed without being overconfident and fans are not putting any undue pressure on the team to stay unbeaten. Bryett who took over as head coach this season, also said he expects a certain level of intimidation..
“We expect intimidation that has already started but I take it as motivation and I am not surprised at it because it is because they fear us” he continued. One thing Bryett can expect is that despite his team being the home team, Gor Mahia fans will be at Thika stadium in large numbers to cheer their team. 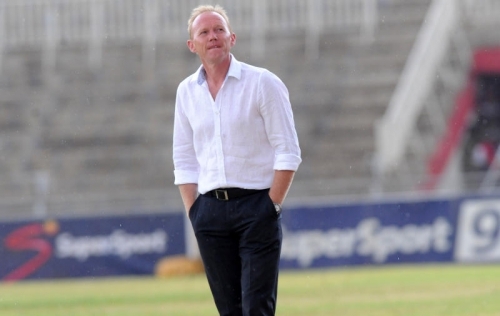 Gor Mahia coach Frank Nuttall has hailed his sides togetherness and team work as the reason for yet another valuable win against a side that played tough and was determined to grab points against Gor Mahia. “A difficult match it was but through teamwork, togetherness plus the discipline, we managed to collect the vital points. That was really a cool finish from Olunga. We overcame any sort of pressure and deserved to win the match” he said according to futaa.com. Nuttall further praised his charges for putting on a solid display despite difficult traveling arrangements. “It was another impressive performance by the boys. We were a bit affected by the travelling but they still gave their best,” he said in a post-match interview. With two games left before the end of the first leg, Gor Mahia are now 9 points ahead of second placed Sofapaka. With 27 goals scorded, they have scored 7 goals more than the second highest team. By conceding only 6 goals, they have conceded 5 goals fewer than any other team. Former Gor Mahia striker Goro Oronge who is a resident of Kisumu city based has praised Kogalo after having had some opportunities to watch them play in Kisumu. 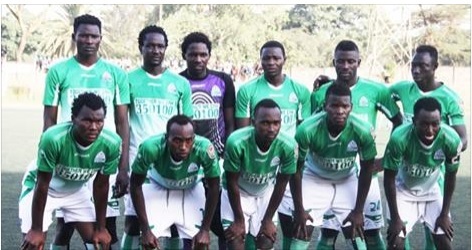 “Gor mahia fc played a great game in Kisumu. Aucho and Olunga were outstanding and almost all the players are young. That is what worries me for we lose concentration in the middle of the game. If this team can be kept together for the next 5 years to mature, then this Gor can make it places. The accurate passes of Aucho and the pace and shooting of Oluonga reminds me of my former team mates the late Abbass Khamis Magongo and Sammy Onyango jogoo. Good goalkeeping was also noticed. Lets keep this team intact and we can claim the lost glory we talk about so much.” said Gor on his social media page. Good of Oronge to notice the stellar goalkeeping of Boniface Oluoch who is largely responsible for the fact that Gor Mahia has conceded only 7 goals so far. Oronge joined Gor Mahia in January of 1985. Much was expected from his since his father Peter Oronge had been a legend for Harambee stars in the early 1960s and was at one time player-coach of Harambee stars. Questionable refereeing between Tusker and Sofapaka. Gor Mahia edged out Muhoroni Youth 1-0 to keep their unbeaten run in Kenyan Premier League match at Moi Stadium on Sunday. Michael Olunga should have scored earlier at the first whistle of the game when he failed to find the far post. Muhoroni Youth defender Wellington Ochieng was beaten to the ball by Khalid Aucho, who found Olunga waiting and his attempt towards the far post went just wide. In the ninth minute however, Olunga did not make a mistake scoring Gor Mahia’s opening goal. Muhoroni Youth defenders will blame themselves for conceding the goal. Instead, of clearing the ball, they raised their hands protesting an Ali Abondo handball and paid for it when Olunga latched onto the ball to score. Two minutes later, Abondo should have connected a cross from the edge of the box but was denied by Muhoroni Youth goalkeeper Daniel Kiptoo who did well to block the shot. Gor Mahia were so dominant that their opponents had not even made a single shot at goal by the 20th minute. This was however, to change in the 21st minute when Abbas Akinyemi had an opportunity to shoot at goal but it was fruitless. The home side preferred to stay at the back hoping to catch Gor Mahia on counter-attack but it did not work. Gor Mahia showed a lot of discipline in midfield rarely losing the ball and with a back four playing well, their opponents rarely found room to give them problems. By the 25th minute, Gor Mahia had forced their second corner of the match when Yussuf Mohammed headed out Olunga goal bound shot. Muhoroni made an early substitution pulling out Hamisi Abdallah for Paul Mboya. The new man was cautioned with just a few minutes into the match. But it was Gor Mahia midfielder Godfrey Walusimbi, who was lucky not to have been sent off with dangerous play on Wellingtone Ochieng. The second half was equally action packed but it produced no goals. The best chance for Gor Mahia came in the 75th minute when Ali Abondo hit the post with the ball bouncing back into play. Meddie Kagere was rested towards the end with his place going to Innocent Wafula. Gor Mahia Starting Line=up: Bonface Oluoch – Musa Mohamed – Karim Nizigiyimana – Abouba Sibomana – Collins Okoth – Ali Abondo – Harun Shakava – Meddie Kagere (Innocent Wafula 88) – Michael Olunga – Khalid Aucho. Unused Subs; Jerim Onyango – Ronald Omino – Dirkir Glay – George Odhiambo – Eric Ochieng – Ernest Wendo.